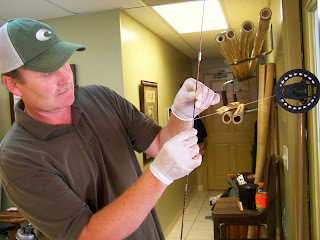 I just completed the first 3 days of a 6 day split class to build my first bamboo fly rod. I am amazed. I didn't realize how much labor and thought that goes into building one of these works of art. Under the watchful eye of Master Bamboo Rod Builder, Bill Oyster and his apprentice, Riley G., five of us started on a journey that is perhaps hundreds of years old. We are first taken to the edge of total destruction of our rods, and then steered into the light only to be taken onto the next gut wrenching step. It has truly been one of the best experiences I have ever had. I am still trying to comprehend the last 3 days after going from a full piece of bamboo as seen in the upper right of the photo to the chocolate bamboo blank I'm wrapping. Ever since Bill and his family moved to Blue Ridge, a steady stream of his students have made their way down the street and into the fly shop. They come to show me their newly finished fly rods. They are beautiful and I knew one day I would have to give it a try. In about a month, we will gather again to work for 3 more days to complete our rods. I really appreciate Bill sharing his knowledge and expertise. He is a true master of his art. If you find yourself in Blue Ridge, be sure to drop by and visit the Oyster Bamboo shop on Main Street. Usually, he will have some of his rods on display. Also, you might visit during one of the classes and get to see a bunch of folks bent over their workbenches taking truly a inspiring journey. David, I am sooooooooo jealous!